Notes: It looks to me that Duncan Jones's movie Moon drew inspiration from parts of Dallos. Mining colonies on the Moon have been supplying critical materials for Earth's survival, but the colonists are feeling disrespected by their mother world, and the overbearing actions of the newly-appointed military governor, Alex Leiger, inexorably drive more and more of the lunar denizens to revolt. They also look to a mysterious ancient machine, Dallos, for support. Like most of us, I grew up watching the occasional anime series on TV, but I didn't really turn into a fan until the early 90's, when Sailor Moon hit American TV and when I discovered, in a local video store that specialized in foreign and "cult" movies, Battle Angel, though I suppose I was originally shown the boundless possibilities of animation years before, with the French/Czech film Fantastic Planet (1972). 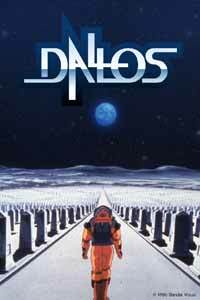 Dallos is another product of yesteryear, a 1983 production notable for two things: as an early work by the future director of Ghost in the Shell, Mamoru Oshii; and as the first OVA series. In the U.S., when something is released directly to video without TV or theatrical showing, it tends to be a low-quality production, but anime has often been a completely different matter, with some of the best writing and production values around. I wasn't bothered by the "old-fashioned" art, but I WAS a bit disappointed in the characters themselves. My favorite SF anime series have always made the relationships among the lead characters the centerpiece, and developed the rest of their worlds through the eyes (and experiences) of those central characters. Here our major young characters, Shun and Rachel, aren't really very substantial- he likes to tinker, while she's a bundle of female stereotypes of the day: no interest in technology, rather easily bored, given to jealousy but usually unwilling to say what's on her mind. She doesn't even have a last name, apparently. Neither of these kids is political; but the aforementioned heavy-handed actions of military governor Leiger start pushing Shun and Rachel toward an alliance with the colony's main revolutionary group, led by one "Dog" McCoy. (This show is obsessed with canines, by the way.) Of some interest is the fact that there might be some parties running callous schemes of their own to deliberately make Leiger look even worse than he actually is. But as characters in their own right, rather than just pawns in the plot, I really didn't see much in Shun or Rachel. The second thing of note is that the four OVAs comprising Dallos are apparently just the opening chapters from a longer story. And I'll say no more about that. And Dallos itself? Nobody really seems to know who built it. But it's provided sanctuary (including breathable atmosphere) for the Lunarians when they needed it, and they worship it as a god. They expect it to intervene on their behalf during the show's revolution, though when the intervention actually occurs the results might be a bit more complex than they expected. It looks very much like a face pointed toward the stars (and is the other great visual the show has), and if that is not anthropomorphizing too much, it implies that there might be a lot more of it buried. More cannot be said. Recommended Audience: Surprisingly violent for its day; lots of space suits get ruptured, and in lunar vacuum we know where THAT can lead. Not for small children; maybe 13+.